Villa Blue Bay is not a luxury villa, nor is it a sublime retreat with sea views. 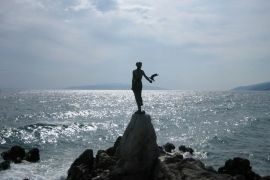 No, it is both these things and so much more. 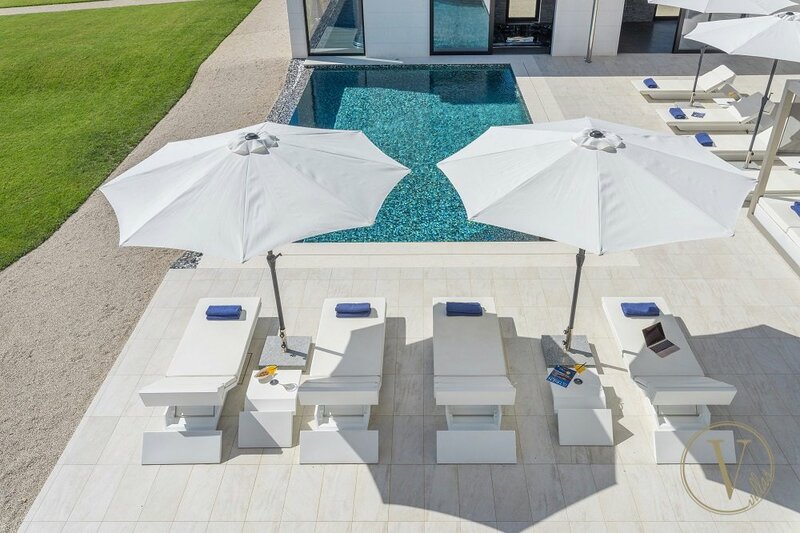 Villa Blue Bay is a total lifestyle experience. 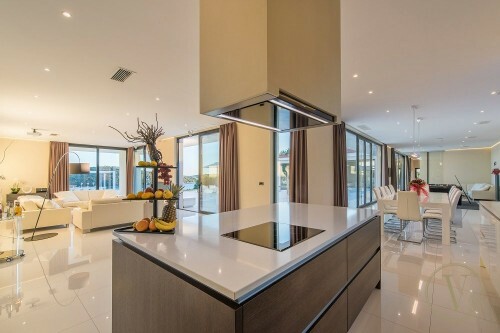 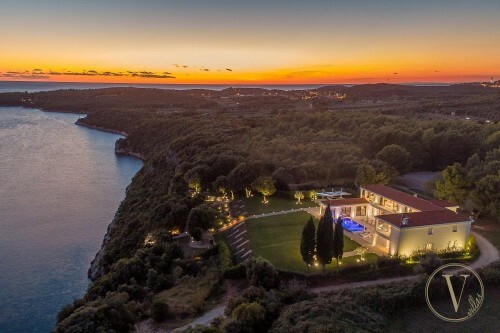 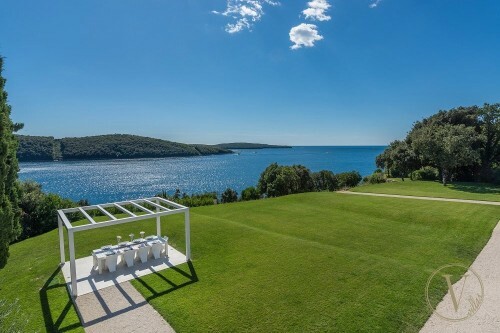 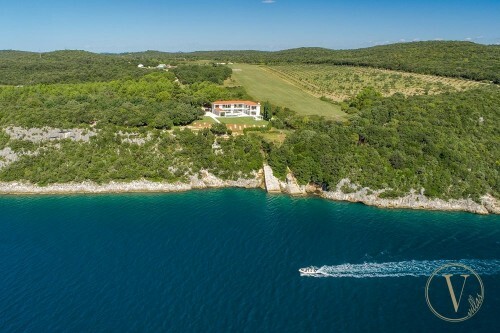 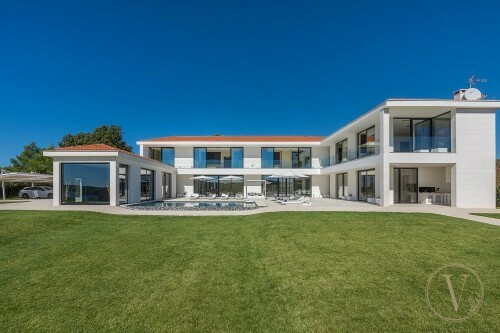 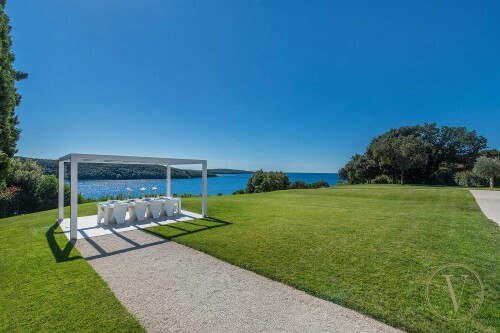 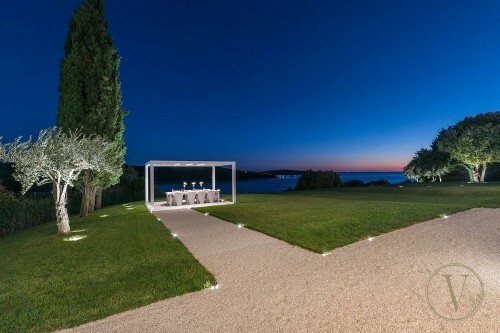 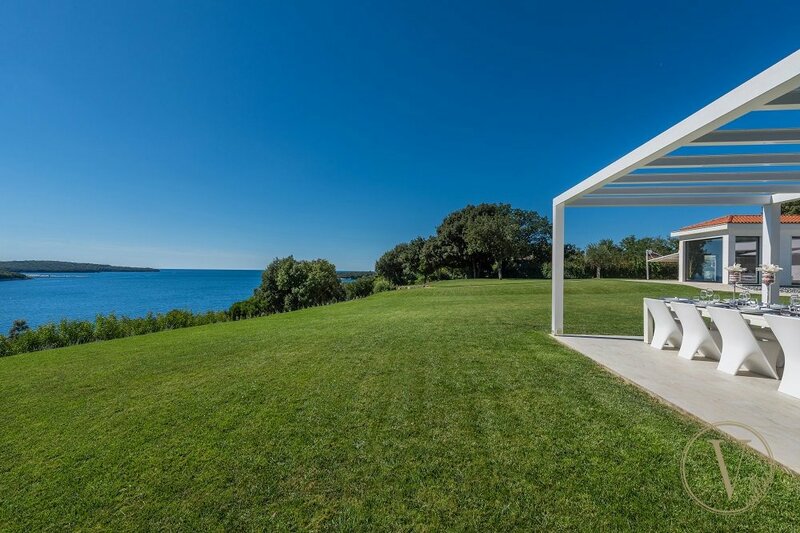 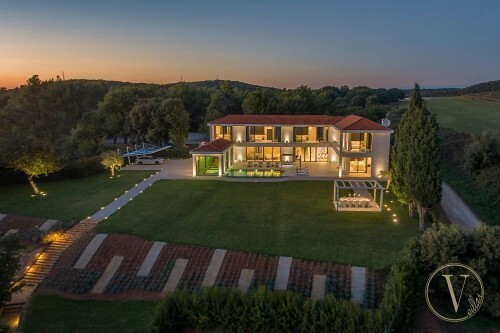 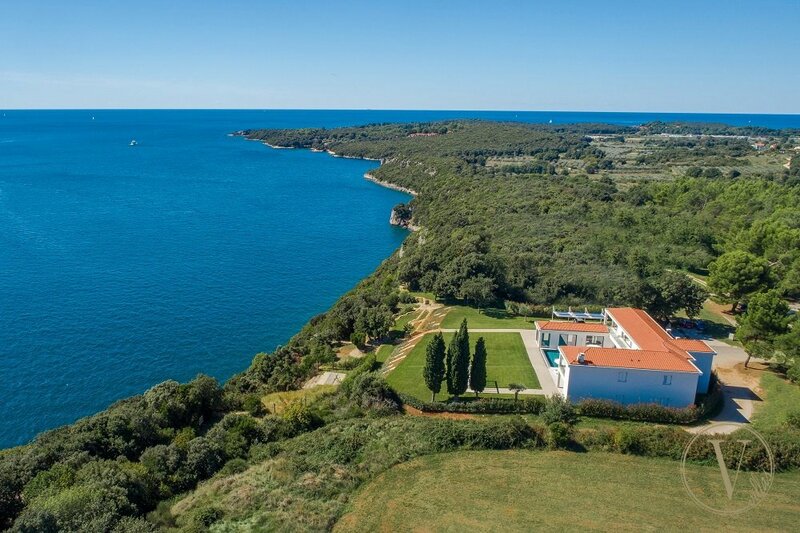 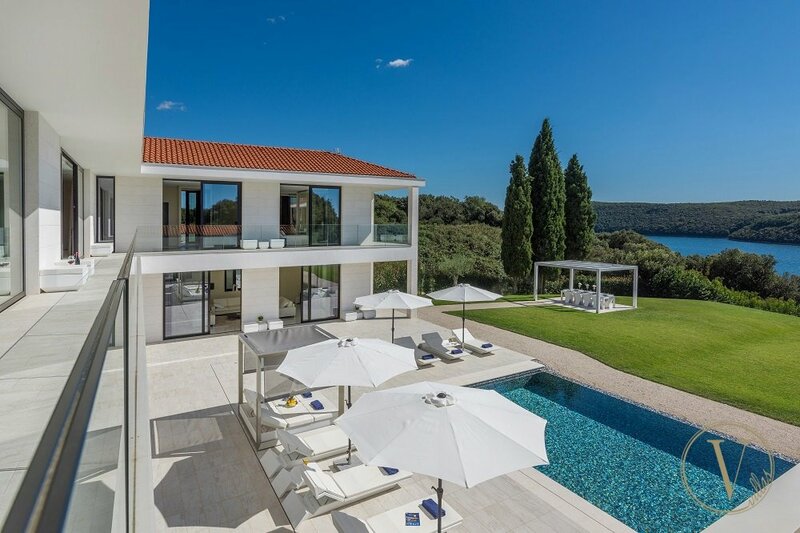 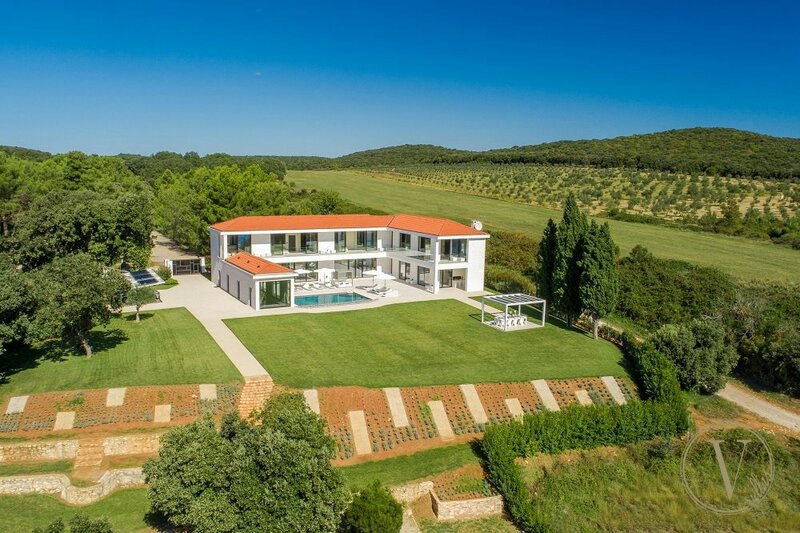 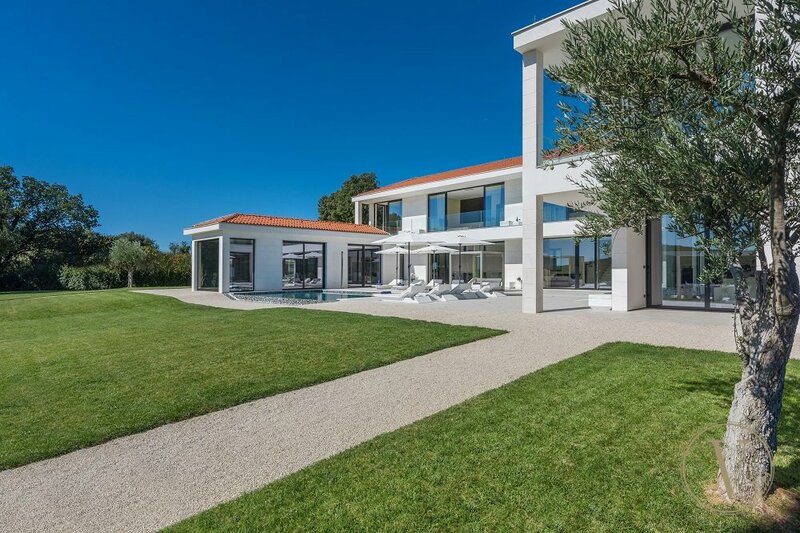 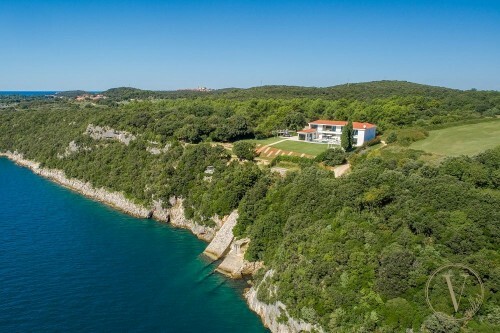 It’s an entire magnificent estate on a secluded stretch of Istria’s coast. 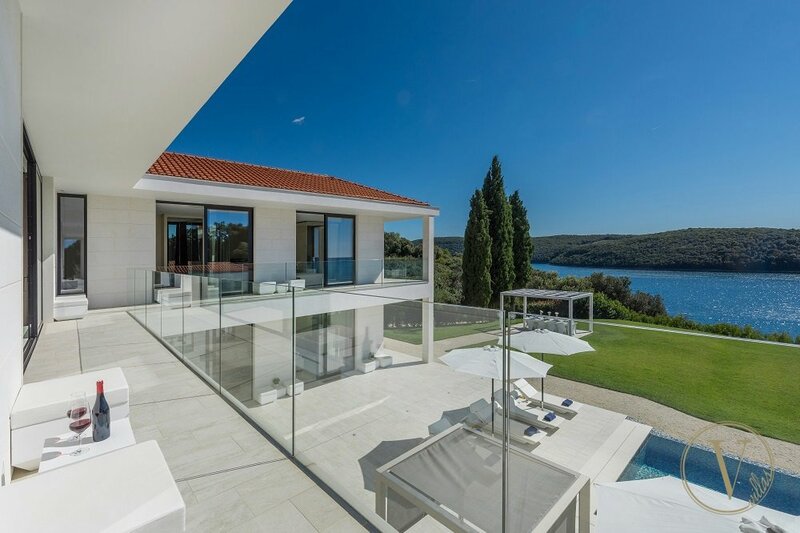 Built high up above the coastline, villa was completed in 2016. 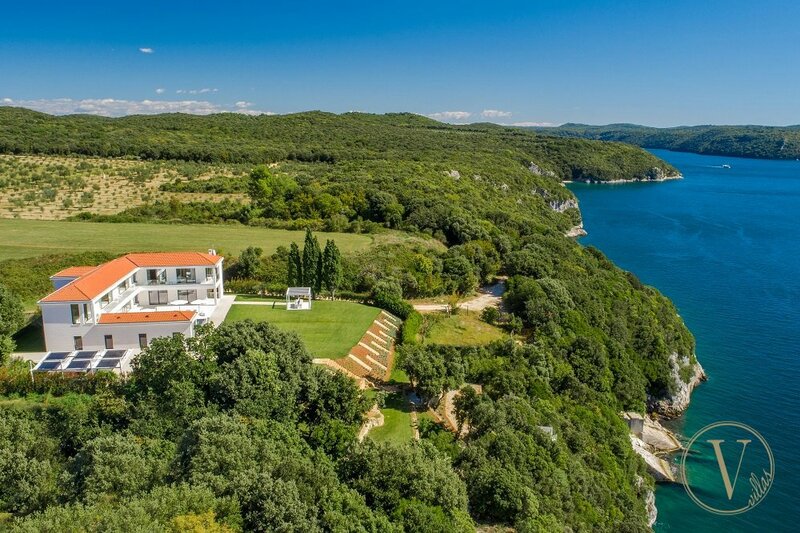 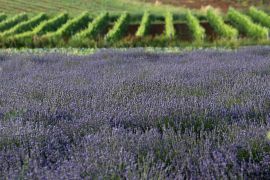 Arriving here is a little like arriving at your own private palace, surrounded by lush gardens, cypresses swaying in the breeze. Wonderfully secluded, with your own private beach just steps away, you can be as anti-social or as adventurous as you like here. Family retreat or party venue, there is plenty of space and room for up to 10 guests, and many different ways to enjoy the pleasures of Villa Blue Bay. 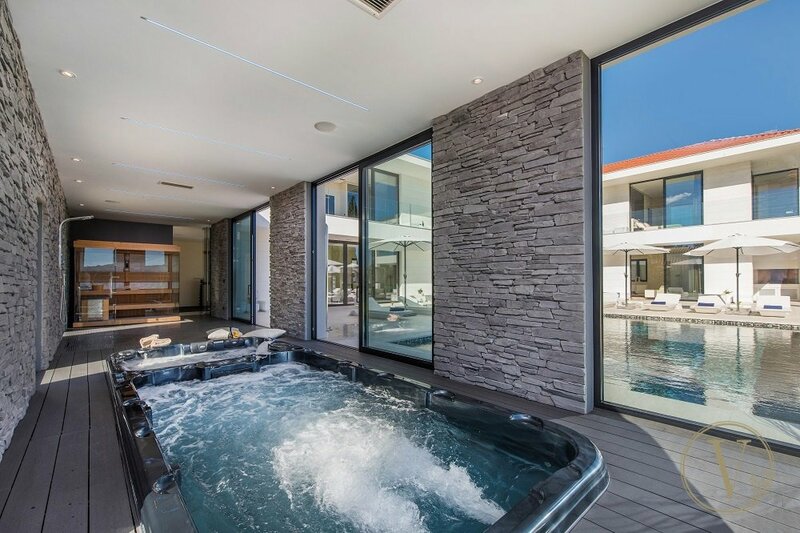 Every comfort is provided, from an indoor swimming pool with counter-current swimming system, to Jacuzzi hot tub and sauna. 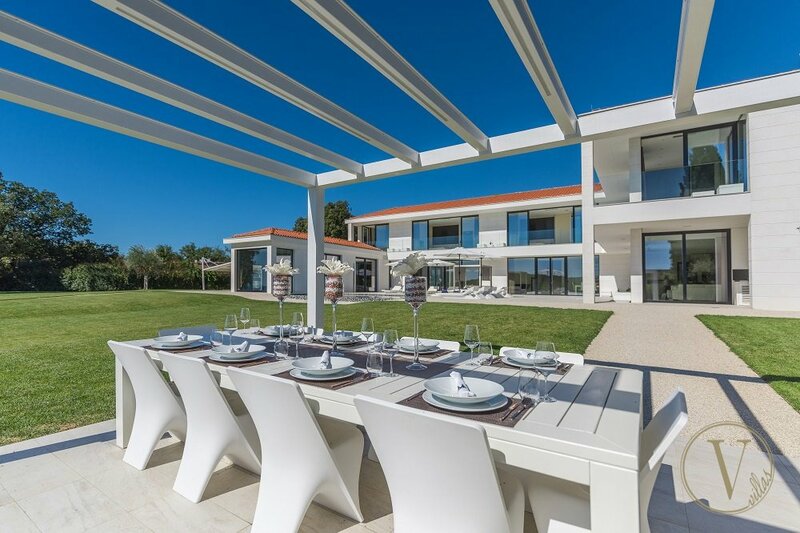 Dining is also part of the pleasure here, whether you choose to eat al fresco, or around the white dining table indoors. 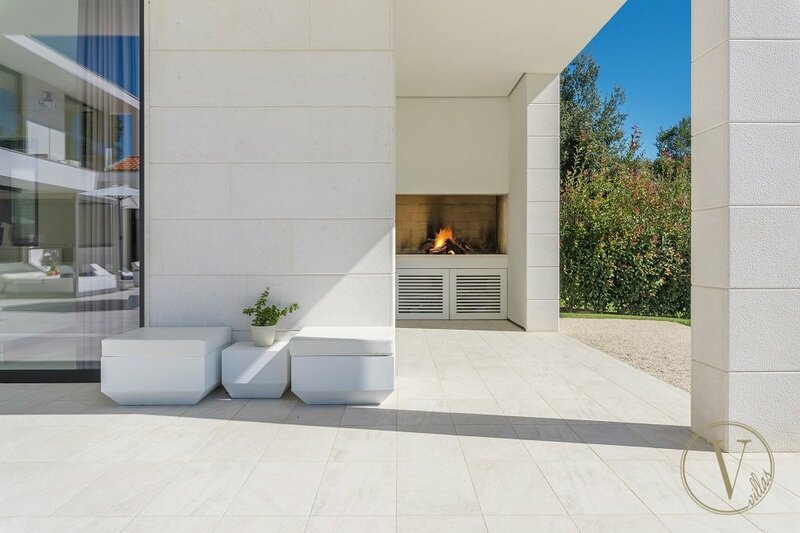 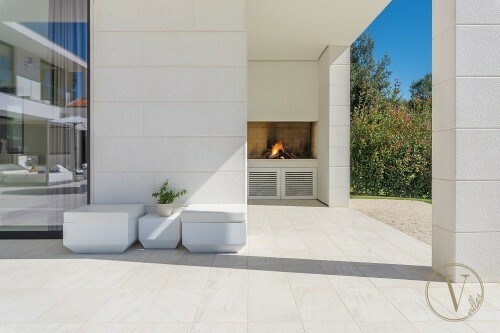 There are as many sofas outside as in, so cocktails can be served anywhere: by the pool, on the terrace, or sitting with your toes in the grass. 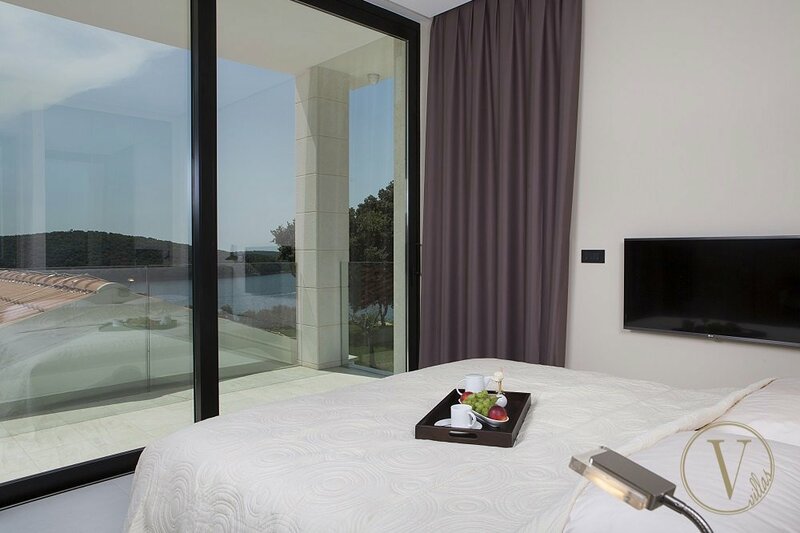 Everything is kept immaculately clean by two housekeepers and there is a villa manager to make all your arrangements. 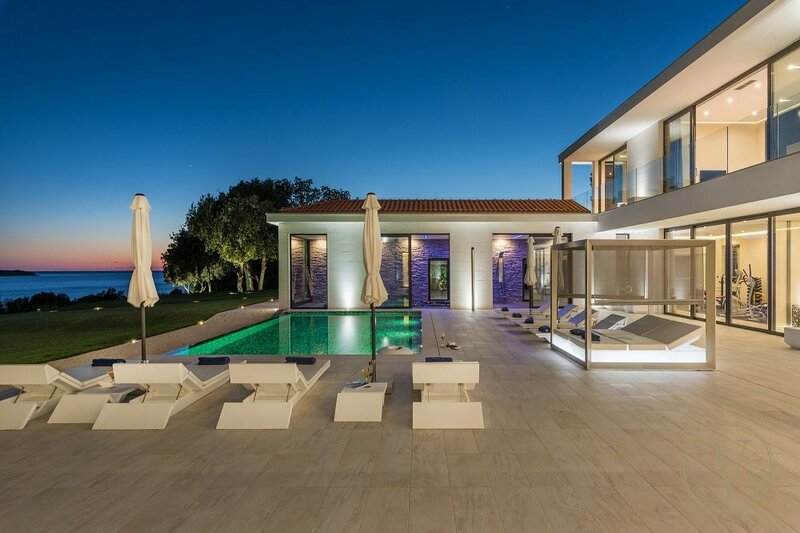 Your villa manager can book massages and beauty treatments, nannies and babysitting. 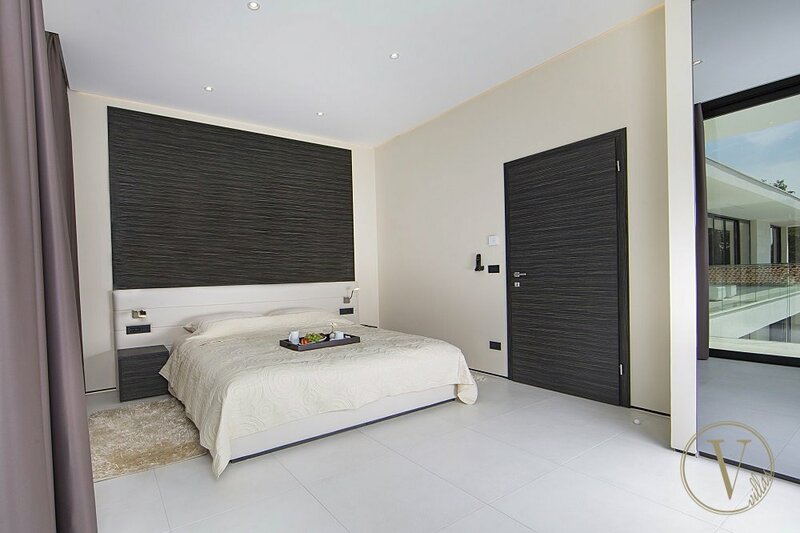 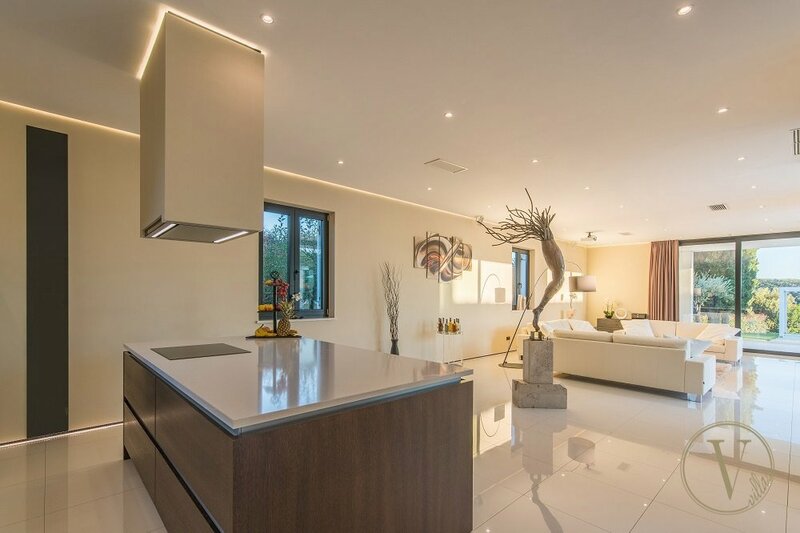 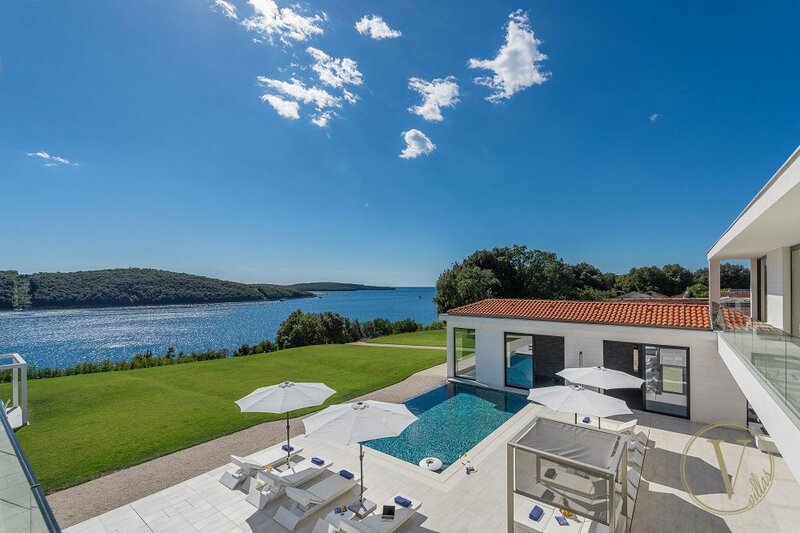 You could have Villa Blue Bay ready stocked with groceries and fine wines, and arrange for meals to be delivered or even a private chef to cook for you. 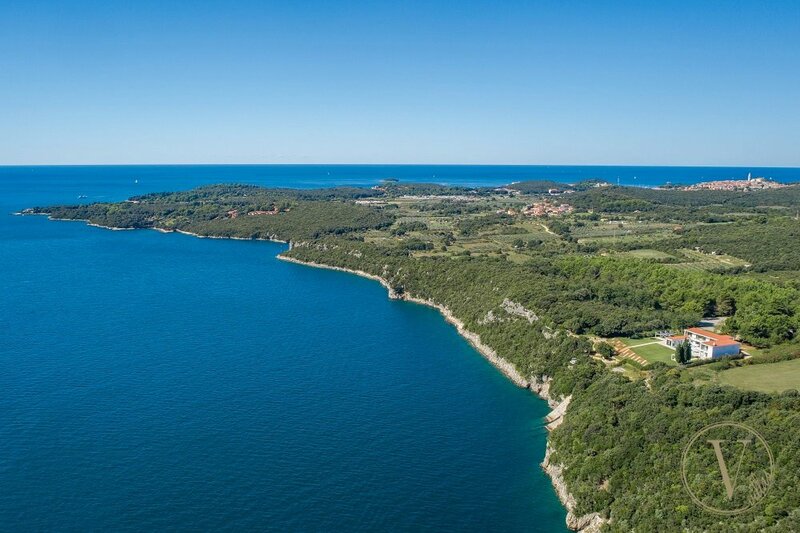 You can go sailing or play golf or tennis. 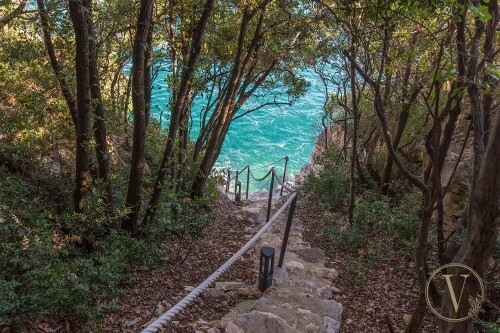 Whatever you desire, it can be arranged. 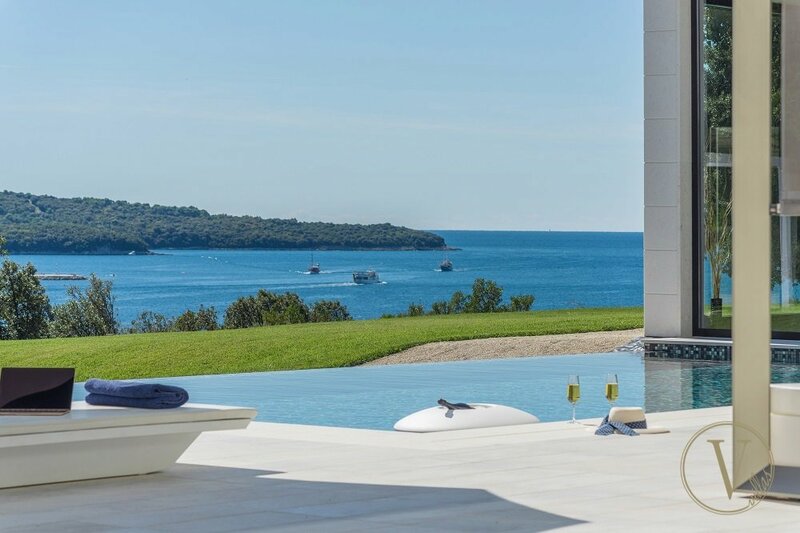 Villa manager is at your service, and everything at Villa Blue Bay is tailored to give you a truly personalized experience. 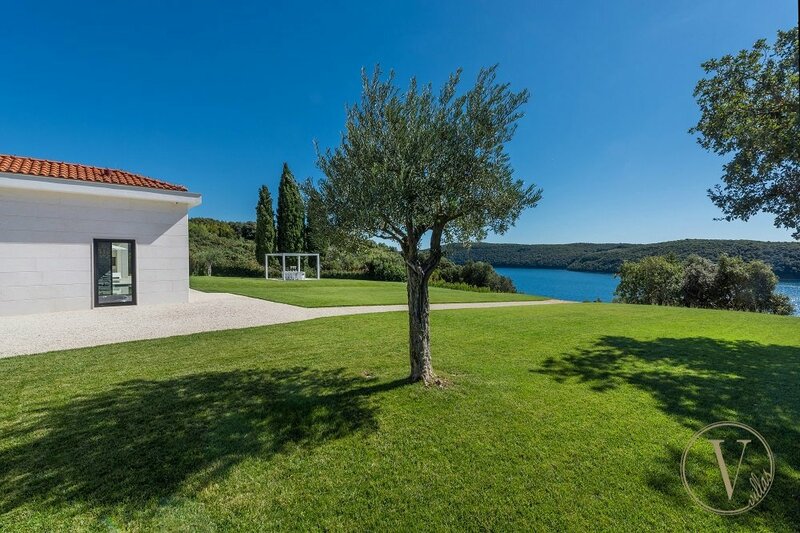 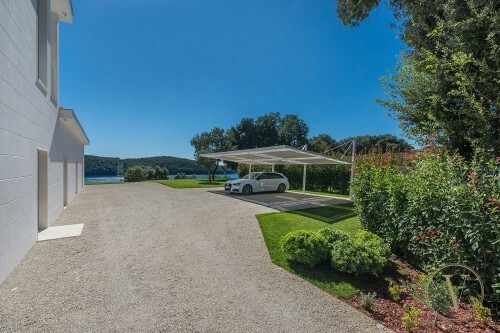 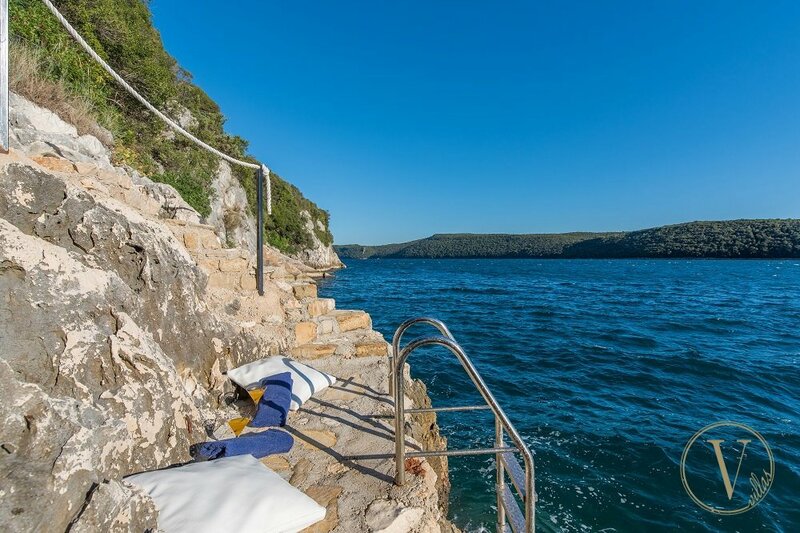 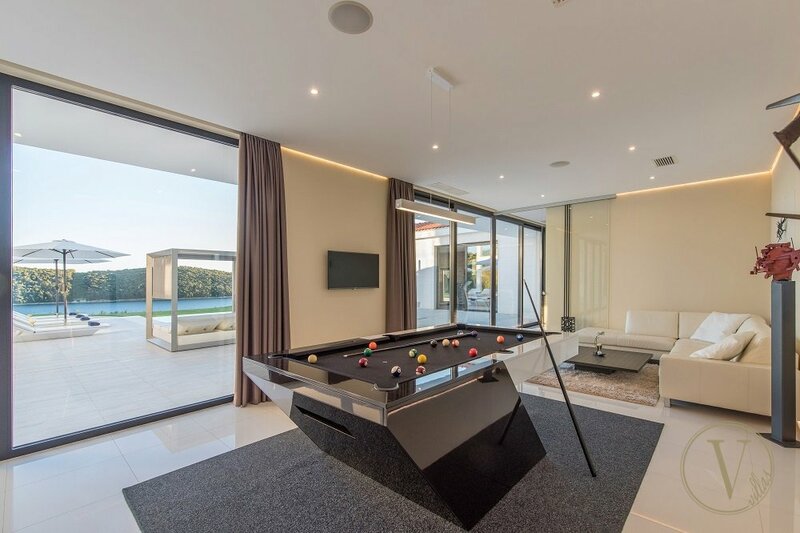 Villa Blue Bay is situated in a peaceful and intimate location of the nature reserve Limski kanal (The Lim bay), one of the most beautiful landscapes of Istria. 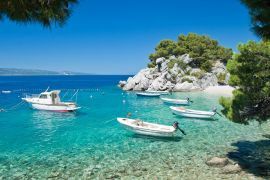 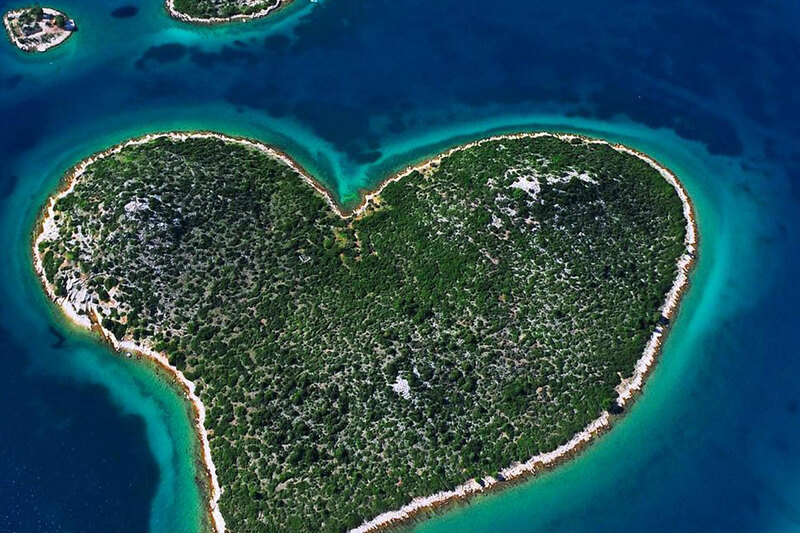 The Lim Bay, known as the channel or the fjord, is protected landscape located on the west coast of Istria, near Vrsar. It is a sunken karst valley, almost 13 km long. 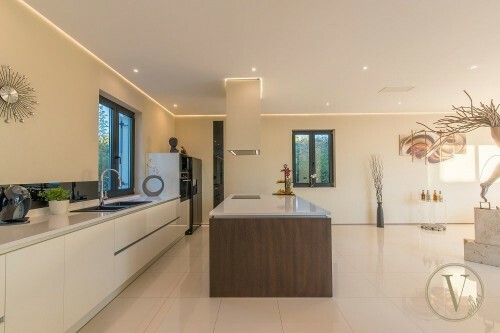 It is gradually getting narrower from the entrance on. A particular feature of the Lim Bay is its brackish water resulting from the subterranean sweet water in the form of submarine karst spring emerging at the bay's end, making its salinity much lower. A high concentration of oxygen creates specific features and enables a high bio production of planktons, fish and shellfish for breeding, especially mussels and oysters. 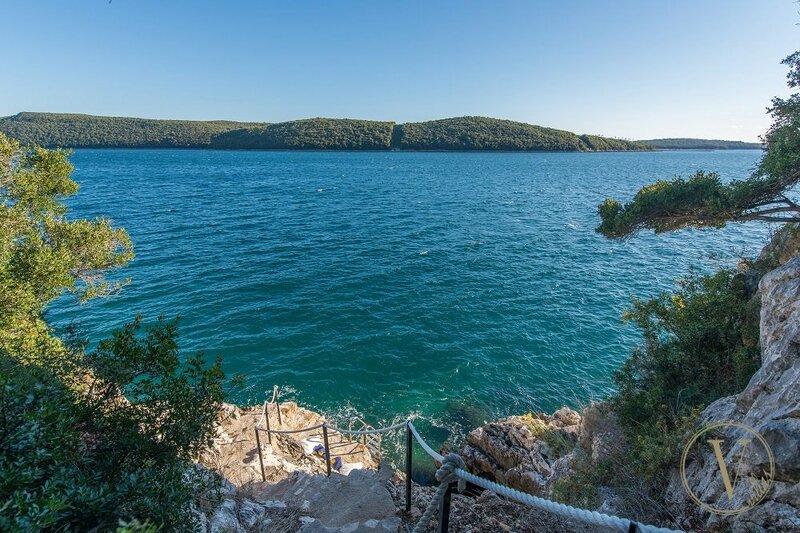 The bay coast is rather steep and high. 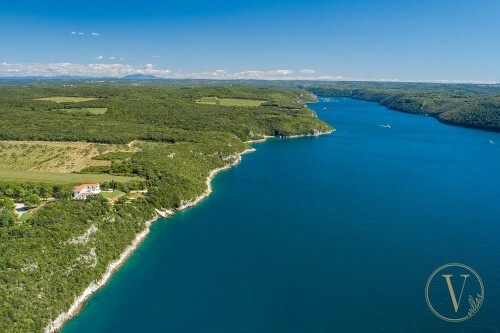 The northern side is covered by evergreen vegetation and the southern by deciduous trees. 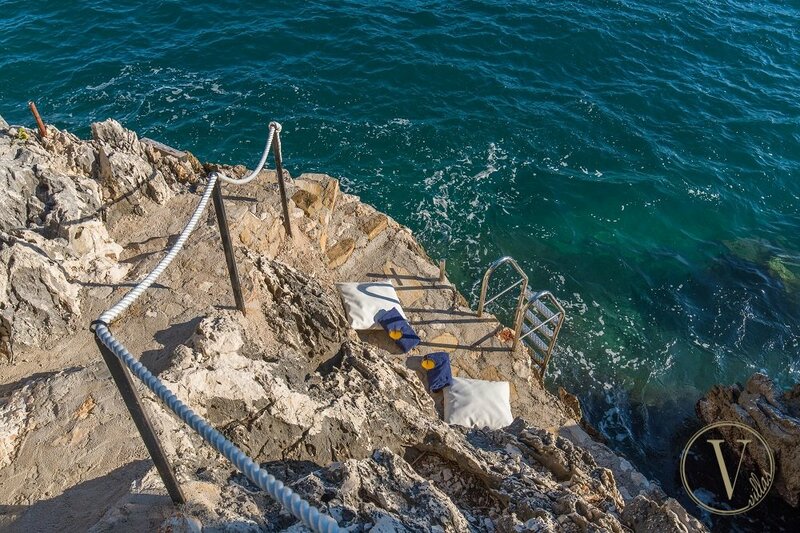 Northern coast verticals show four dark openings of larger semi-caves and caves, of which the most important is the Romuald's Cave. 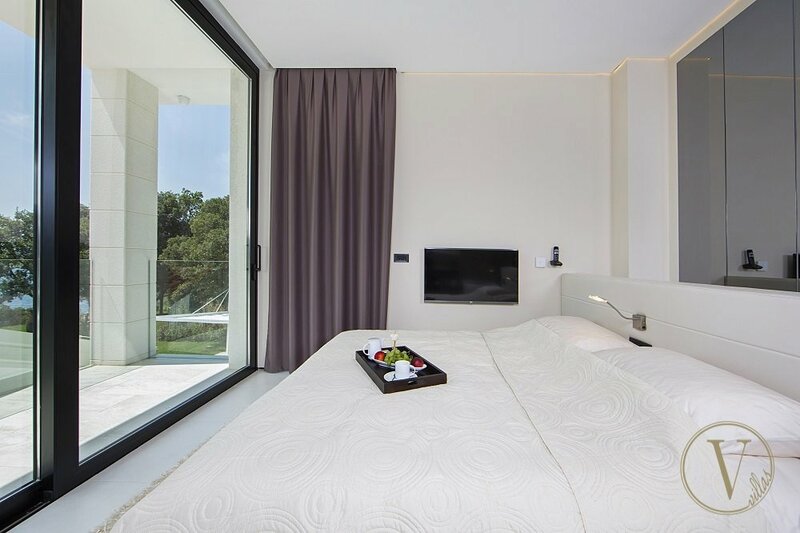 The price includes: VAT, tourist tax, welcome package, basic daily cleaning, housekeeping service from 07:00-23:00 every day, 24/7 villa manager at guests’ disposal and all as listed on the villa homepage. 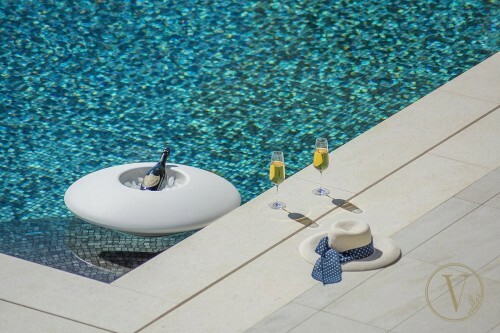 Wide selection of premium wines & spirits available at additional charge. 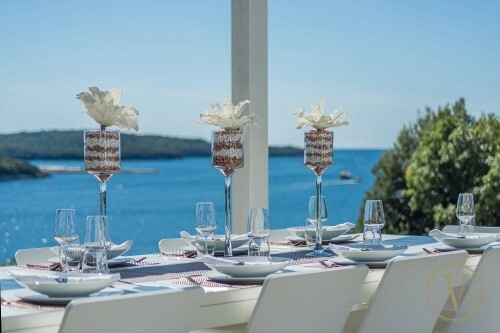 Land/sea/air transfers, grocery delivery service, on-demand chef service, babysitting service or anything you might need can be arranged on request and subject of pre-order and additional charge. 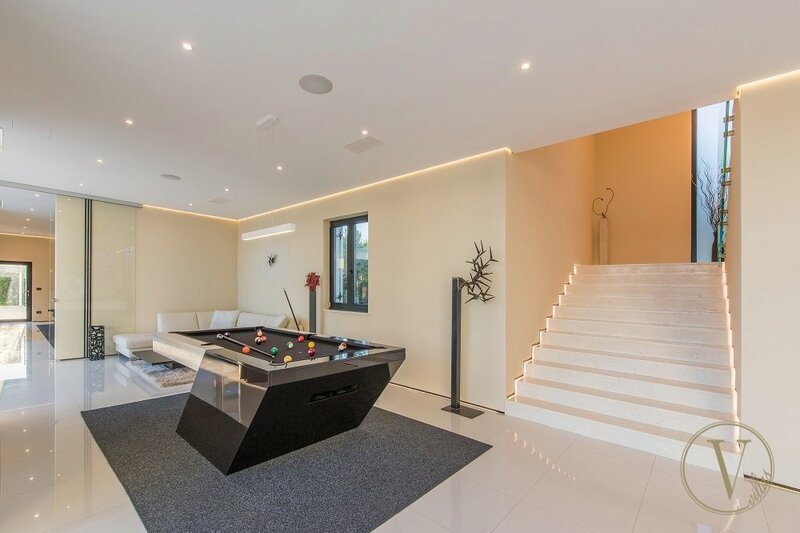 Indoor pool with counter-current swimming system. 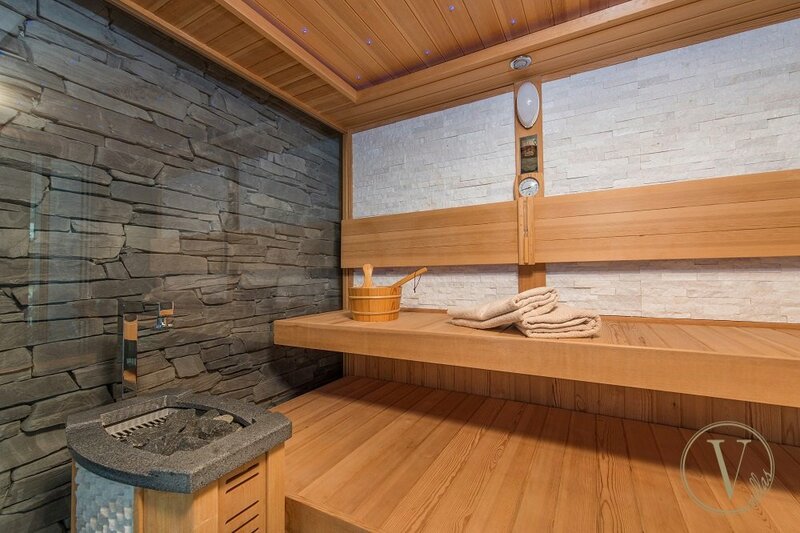 Jacuzzi hot tub & sauna for 6 people. Multi-purpose bench press, Orbitrek, exercise bike, yoga accessories, weights. 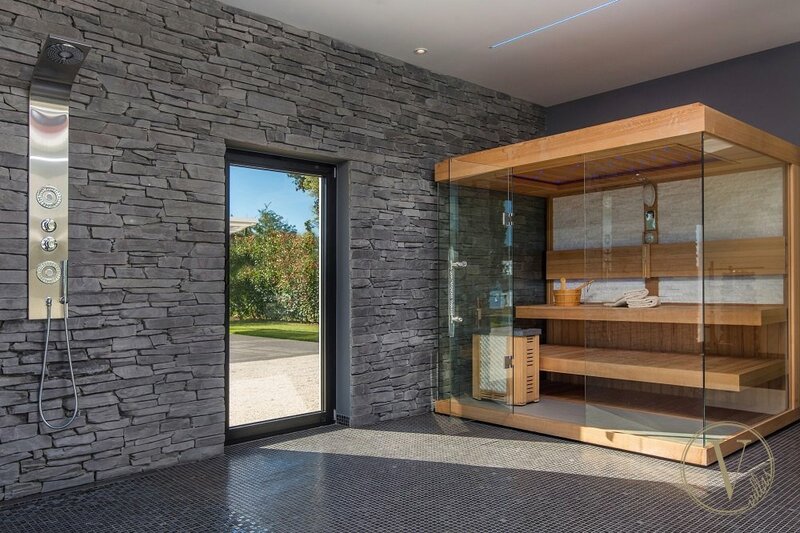 Sauna & Jacuzzi with shower. 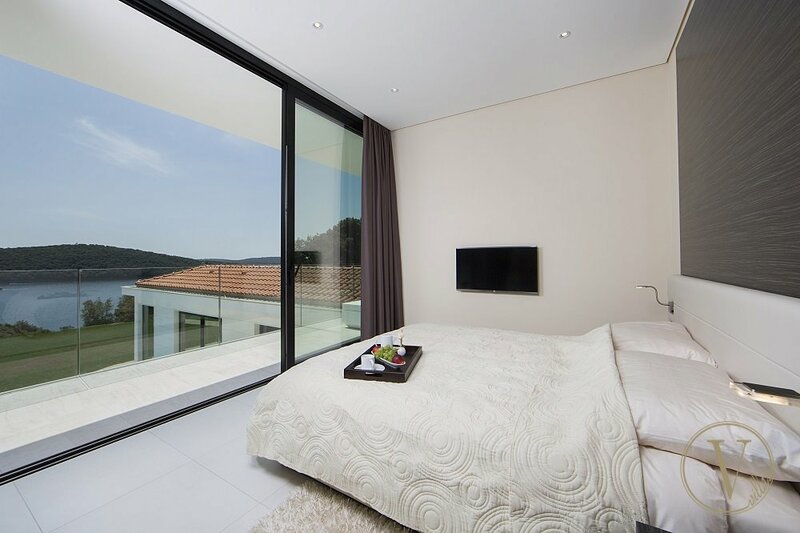 Bedroom #5 bed works either as king double or twins. Bed linens are provided and changed according to guests' demands. 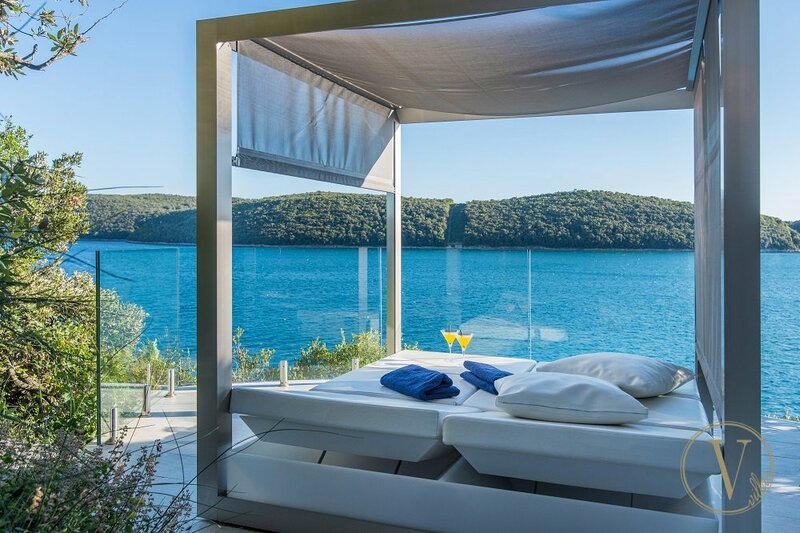 All bedrooms have SAT TV, Wi-Fi, A/C and terraces with sea view. 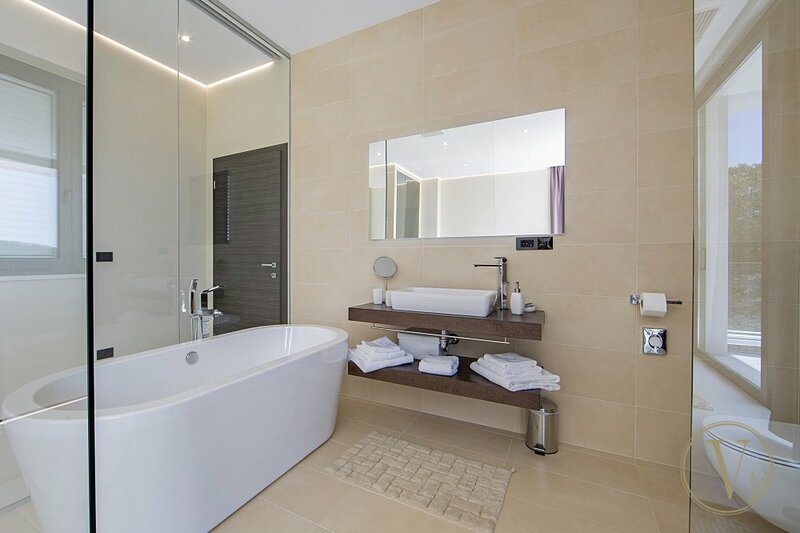 Bathroom towels are provided and changed according to guests' demands. Bar with wide selection of premium wines and spirits available at additional charge.